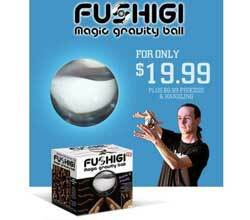 The Fushigi Magic Gravity Ball is the new sensation that lets you mesmerize the mind and confuse the senses. It is a form of contact juggling where you make the magic ball appear to move on its own or even appear to floating in thin air. Not only is the Fushigi an amazing to show off, it is also an incredible and therapeutic form of relaxation. Anyone can learn to use the Fushigi no matter their age. It is simple and you don’t have to been a magician or a professional either. With the include instructions you can learn how to master the Fushigi, mesmerize the mind, confuse the senses, and blow away your friends with cool tricks in no time. This contact juggling ball is absolutely wonderful. It is crystal clear and very beautiful, it has a good weight and good surface feel. Great bargain at this price. This particular ball is toward the larger size which is perfect for me. I have big hands. If you are new to contact juggling and tall you might want to give this ball a try. I highly recommend it. I cannot believe how beautiful it is. To keep it preserved and to carry it around you might want to get a pouch.This is the one I purchased and it fits nicely.